These drunken berries are the life of the party! Serve with our dairy-free amaretto gelato for a wicked fresh adult dessert. 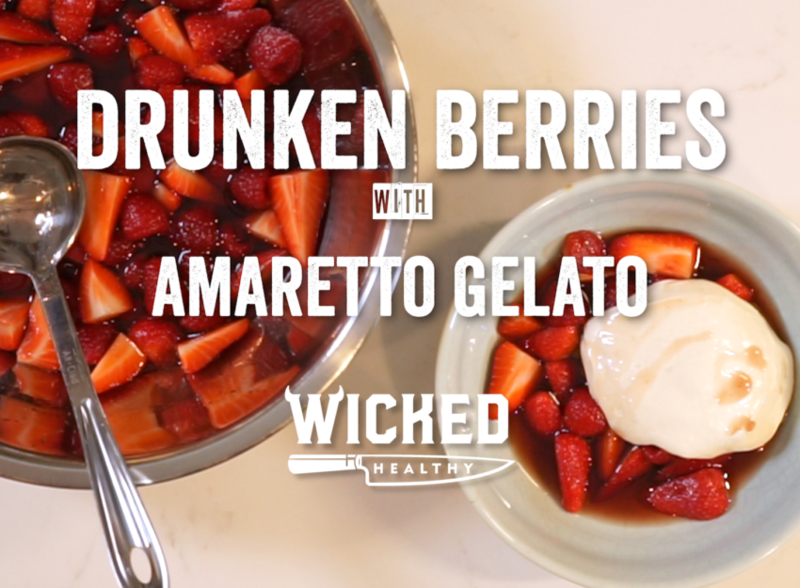 Grab some amaretto and berry liqueur … you’re going to need it for this wicked boozy dessert! We’ve got two components going on here: rich Amaretto Gelato made with raw cashews and coconut milk for richness, with some agave and a little sea salt to balance everything out. For the Drunken Berries … use what you got: strawberries, blueberries, fresh currants, etc. We’re not going to soften them up with heat or cooking; instead, we’re going to let the booze do all the work, by letting them hang out together for a few hours before serving. The recipe for this super simple but unique dessert idea is in our cookbook, available now in the US and the UK! You can use the leftover soaking liquid as a syrup for pancakes, or in a cocktail if you want! If you make a recipe from the cookbook, be sure to tag us (@wickedhealthy + #wickedhealthycookbook) so we can see! Need to use up any leftover coconut milk? Chuck it in these wicked healthy dishes!! Berry surplus? Use them up in breakfast! !